Now and again, we’ve noted that the touch screen responsiveness on the iPod Touch MC011LL disappears. E.g. Touching and moving the finger across the screen produces no action from the iPod, so that you cannot unlock it to play music or run other apps. The only method we’ve found to restore responsiveness to the touch screen, is to forcibly reboot the player. 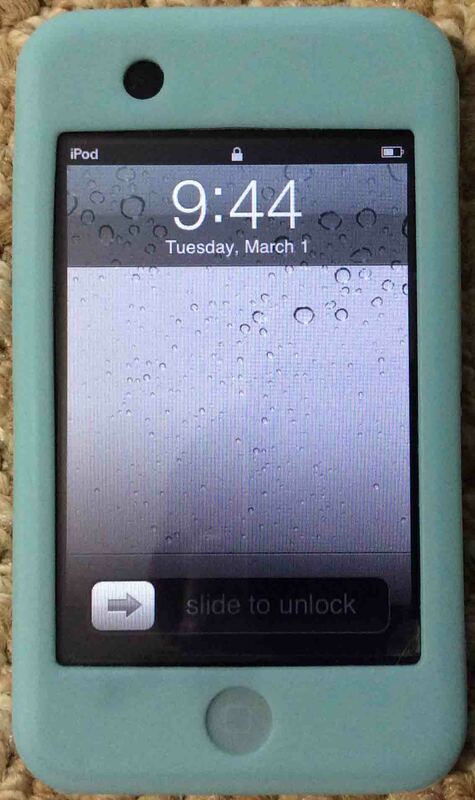 iPod Touch portable player, displaying the Lock screen. However, rebooting can’t be done in the preferred way without actuating the slider bar on the Slide to Power Off screen, as shown next. Without touch screen responsiveness, you won’t be able to move the power off slider to the right. While you could plug your iPod into an iTunes equipped computer and reboot it from within iTunes, or just allow the iPod battery run dead, we prefer neither of these options. Why? Because a user may not have a PC running iTunes nearby. And most folks may not have the time to wait for the battery to discharge enough to completely shut down the iPod. There is however, another way. To reboot (soft reset) an iPod Touch player that is ignoring touch screen gestures, press and hold the Sleep and Home buttons at the same time. 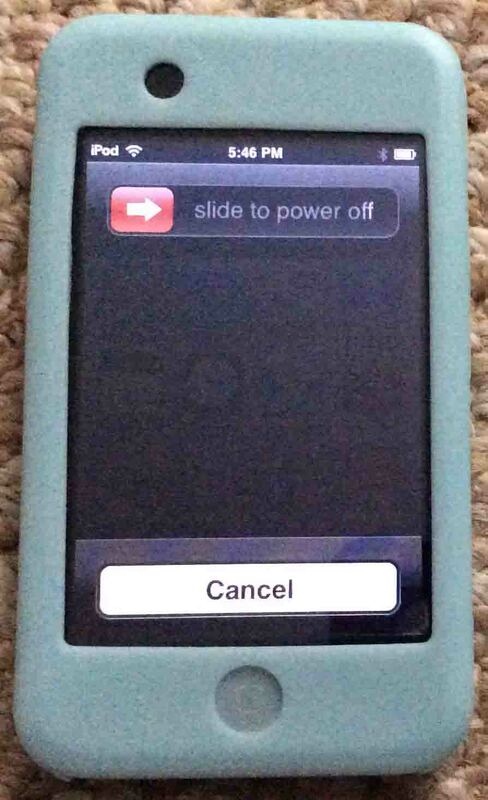 Notice that the red “Slide to power off” slider appears, as pictured above. But, just keep holding both buttons in. After a few seconds, the power off screen goes blank, and then after a short period more, the Apple logo appears, indicating a reboot in progress. Release the buttons when you see the logo, as pictured next. 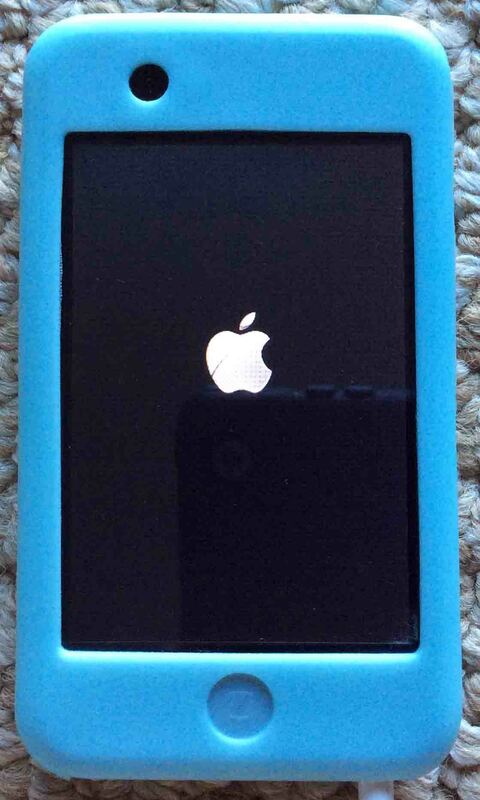 iPod Touch Boot Screen, which appears after power on. After one or so minutes, the lock screen should appear, as shown next, and hopefully now, you’ll be able to work the Unlock slider once more. Rebooting typically resolves frozen touch screens. Note that this soft reset procedure does not erase the music, contacts, email, and other data on the iPod Touch. To avoid being bitten by the frozen touch screen problem, we normally do not allow our Touch to go completely dead, as doing so might result in a hung touch screen upon the next reboot. Also, avoid static electricity; particularly around the data and headphone ports. Be particularly careful when handling your iPod in very dry locations. The procedure explained here has been successfully tested on iPod Touch portable players running iOS 5.1.1 (9B206).